We Cover Your Special Event ! Aardvark Armadillo Tents Inc. is the tent rental company for you. 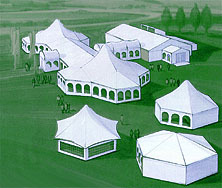 We have a wide selection of top quality tents for any size of event. Aardvark is proud to be a Canadian company. Over the past 25 years we have supplied tents to thousands of clients in the movie, wedding, community event and special event industries. We are pleased to be working with the best caterers, decorators, florists and party supply rental shops in the lower mainland. We do our best to excel in service and stand behind our products 100%. At Aardvark, our clients always come first. We will be there for you - at any time, on any day. We'd be happy to provide you with a quote for every one of your tenting needs.